← Per-country limits in question? USCIS has now posted notices for regional centers terminated through March 2018, and I’ve added them to my termination log. Now we know the reasons behind about two thirds of the 250 regional center terminations to date. USCIS has framed its activity in terminating regional centers as an integrity measure, but in fact only 11% of terminations so far have been due to integrity problems. The majority of terminations have been because (1) the regional center has not secured EB-5 investment in the past three or more years, and/or (2) USCIS did not receive the regional center’s Form I-924A annual report and fee on time for the most recent year. The letters themselves are interesting for discussion of a topic not fully explained by the regulations or policy: what does it mean to promote economic growth? What must a regional center do, exactly, to justify its continued existence? How can the definition of “failure to promote economic growth” be stretched to cover the various reasons USCIS might want to terminate a regional center in practice? Live in America-Midwest Regional Center is an example of an as-yet inactive regional center that’s part of an active network. USCIS issued the RC a Notice of Intent to Terminate for three years of I-924A that did not report any EB-5 investment. The Regional Center countered by pointing to successful projects sponsored by other regional centers in the Live in America network, arguing that this demonstrates LIA’s proven ability to get projects done, and potential to promote economic growth in the regional center geography. The RC indicated that is exploring and actively seeking investment opportunities, has met with EB-5 project candidates, and has entered into strategic partnerships. USCIS responded that the RC cannot rely on evidence of projects outside its approved geographic area, and that the future plans described are merely “future aspirational goals,” and do not count as “actually engaged in the promotion of economic growth.” Having an operator that’s been demonstrably successful in promoting economic growth did not save Live in America-Midwest Regional Center from termination. Sorry, Minnesota! The Midwest has had any regional centers at all thanks in part to serial regional center operators who can afford to give low-profile geographies a chance because they also have feet in New York and California. But USCIS appears less willing to give the Midwest a chance. Attract EB-5 investors within three years (or at least, get term sheets and file an I-924 amendment) or thy regional center designation shall be terminated. Charlotte Harbor Regional Center is a cautionary tale of what can happen when a regional center does not have copies of documents submitted by its investors to USCIS in I-526 petitions. USCIS terminated Greater Houston Investment Center, LLC for inactivity, and declined what seems to me a sensible request: the option to reactivate designation if a project opportunity presents itself in the future. America’s Regional Center was terminated in 2017 for lack of activity (no investors in 3 years), but was restored on July 5, 2018 to the list of approved regional centers. 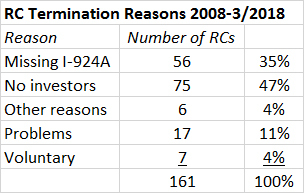 No appeal has been published, so I don’t know how the RC overcame the termination decision. Powerdyne Regional Center‘s mistake was to hire a President who turned out to be a wanted man in China. The reasons why a regional center may no longer serve the purpose of promoting economic growth are varied and “extend beyond inactivity on the part of a regional center.” 75 FR 58962. For example, depending on the facts, a regional center that takes actions that undermine investors’ ability to comply with EB-5 statutory and regulatory requirements such that investors cannot obtain EB-5 classification through investment in the regional center may no longer serve the purpose of promoting economic growth and may subvert a purpose of Section 610(a)-(b) of the Appropriations Act, which provides for regional centers as a vehicle to concentrate pooled investment in defined economic zones by setting aside visas for aliens classified under INA 203(b)(5). Likewise, a regional center that fails to engage in proper monitoring and oversight of the capital investment activities and jobs created or maintained under the sponsorship of the regional center may no longer serve the purpose of promoting economic growth in compliance with the Program and its authorities. The SEC has announced its first EB-5 fraud action this year: Securities and Exchange Commission v. Palm House Hotel LLLP, et al., No. 9:18-civ-81038 (S.D. Fla. filed August 3, 2018). The SEC is rather late to the party, following United States of America v. Robert V. Matthews and Leslie R. Evans (3/14/2018) and a civil suit filed by EB-5 investors in 2016. (Though not as late as USCIS, which has not terminated the regional center involved even as it hustled to terminate Lansing EDC.) The allegations are familiar: misappropriation of investor funds by people who arranged to have unfettered access to those funds. I note that the SEC’s list of defendants is much shorter than the list of defendants in the complaint by investors. The SEC identifies the regional center principals as responsible for misrepresentations, while investors also felt misled by the consultants and service providers involved. USCIS updated the Processing Times page on August 1, with improvements for all EB-5 forms (-23 days for I-526, -5 days for I-829, and -63 days for I-924). As I hear anything new on the Yoder amendment with potential to remove per-country limits for EB-5, I add it to my previous post. Not that I have heard much. Since the explosion of conflicting comment on my post, perhaps others in EB-5 have learned better than to make statements on this topic. (Update: IIUSA has finally made a comment.) I guess that response has also been complicated by the difficulty of reading the amendment text; it appears that even Yoder and the House appropriations committee may not have initially understood what was actually in it. I hear that my reader comments are being noticed and appreciated, and I hope that those comments help inform discussions among the powers that be. I keep an eye on www.reginfo.gov just in case EB-5 regulations should proceed after all to the review stage in time to be finalized in August 2018. But nothing there yet. If it is extended in September, does anyone know how long that extension would be for? What I hear is that there’s likely to be a Continuing Resolution to extend current government funding (which includes regional center program authorization) at least past the November mid-term elections, probably into January. Ok, that would be good. Thank you! What are the chances of passing HR 392? Thanks … Sorry I meant Yoder amendment ( Since its similar to HR 392 I used that). Whats the chances of passing ? I should not give advice on this because I am not close to government affairs and haven’t done careful investigation. I just assume that the 115th Congress won’t manage more major legislation beyond funding bills, and that it will strive to leave immigration out of the funding bills. But I don’t know. The talk in EB-5 is that the Yoder amendment is unlikely to get in the final draft. But I see that H.R.392 has gained strong bipartisan support, with 327 co-sponsors, and I hear that it’s benefited from significant lobbying.